Advertisers work hard to convince us that what we drive defines who we are. But that trick costs all of us money (after all, who wants to be a 1974 Pinto?). My sister-in-law once had so many clothes that she purchased three commercial clothes racks and expanded her closet into the basement. 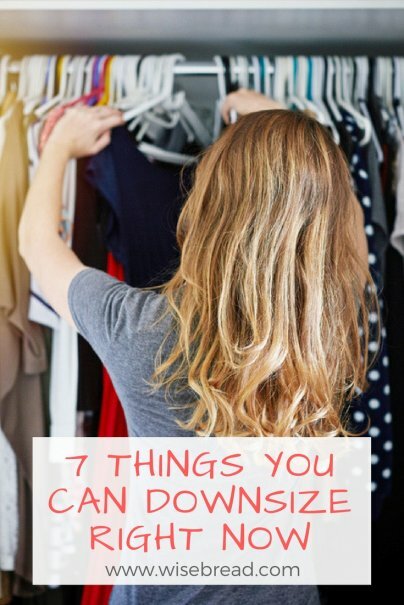 If your wardrobe is gobbling up more square footage every year, it might be time to downsize. From gourmet cheeses to beauty supplies, subscription services deliver the world to our doorstep. But all that convenience comes at a price. Take a hard look at your bank statement and your spending habits. Are multiple subscription services nickel-and-diming your budget to death? Is most of that gourmet cheese growing fuzz the fridge? If the answer is "yes," switch to a less expensive subscription package or cancel altogether. Once you've downsized your spending, attack the three-headed monster it created — debt. While it makes perfect sense to pay off debt with the highest interest rates first, many people find more success using the debt snowball method. In this approach, you pay off your smallest debt first (regardless of the interest rate), which gives you a motivational boost to stick with your downsizing plan until everything is paid off. A dear friend of mine recently started a new job with a college on the East Coast. In addition to this full-time administrative role, he's teaching two classes and interviewing students for a grant program. I love him to death, but saying "no" is not his strong suit.